Sam Manson and Danny Phenton are two misfit high school kids who have been friends since forever. Sam is a self-proclaimed vegetarian goth while Danny is your average awkward guy next door. Both Danny and Sam are in on the secret that an accident turned Danny into a half-human, half-ghost. Sam loves purple and black. She wears a sleeveless crop top, black skater skirt with green lines, purple tights, and chunky black boots. 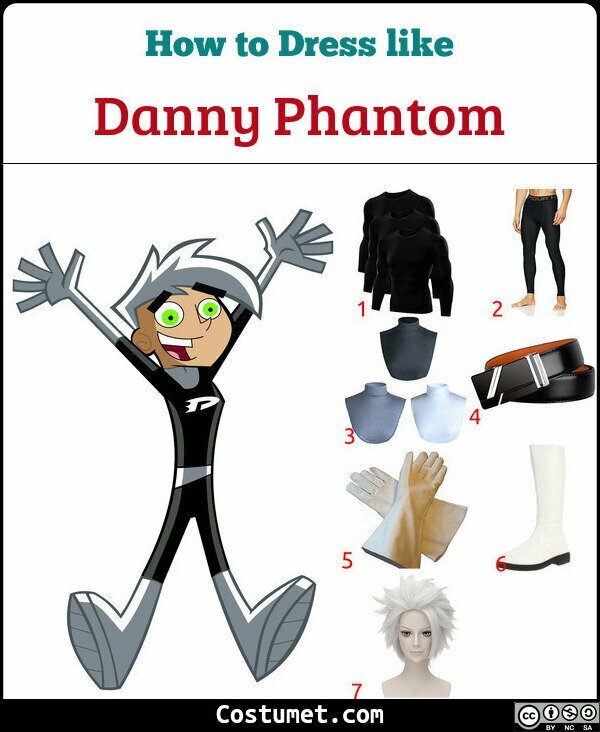 When he is in Phantom mode, Danny wears a mostly black tight suit with white details, white gloves, white boots, and he even has white hair. Here’s everything you need to look like Sam Manson and Danny Phantom. 1 Black Long-Sleeved Compression Shirt Use this black compression shirt as the base of your Danny Phantom costume. Print and stick this logo on the shirt. You can also use white fabric paint to draw the logo. 2 Black Compression Pants Pair up your shirt with this black compression pants. 3 White Turtleneck Dickey Set A great alternative for the top part of Danny’s costume is this white turtleneck dickey. 4 White Belt Wear a white belt around your waist like Danny. 5 White Gloves Danny keeps his ghost hands safe with a pair of white gloves. 6 White Boots When he’s not zooming around, Danny also wears a pair of white boots. 7 White Wig Keep to the ghost look with this white wig. 1 Black Sleeveless Crop Top Sam is a simple goth girl and prefers a sleeveless black crop top. 2 Black Mini Skirt Sam prefers a simple black skirt with a checkered pattern. Use bright green tape to customize your skirt. 3 Purple Leggings To keep her legs warm, Sam wears a pair of purple leggings underneath her skirt. 4 Black Chunky Boots To keep up with her gothic outfit, Sam likes to wear black chunky boots. 5 Black Bracelet Sam also wears two simple black bracelets on both her wrists. Sam Manson was voiced by Grey DeLisle and Danny ‘Phantom’ Fenton was voiced by David Kaufman.